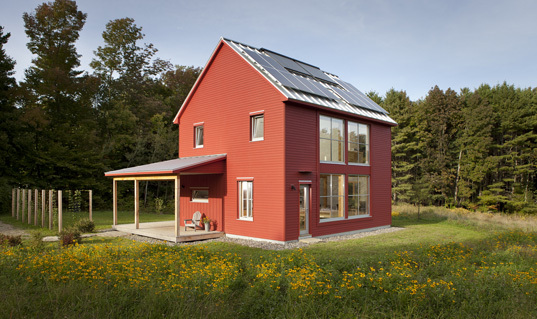 The bright red GO Home in Belfast, Maine was recently selected as the LEED for Homes Project of the Year for 2011. Completed by GO Logic, the seemingly simple house packs an impressive renewable energy punch and is a LEED Platinum and Passive House certified residence. Because it is a passive house, the home’s owners will see a 90% reduction in their heating bill, resulting in a cool $300 dollars per year for space heating, while enjoying all the comforts of the super insulated building shell during the winter months. With a roof clad in solar panels, The GO Home is also net zero, creating all the energy on site that it needs to provide heat, hot water and electricity for the home owners who will not see an energy bill for the next 25 years.